The December 2014 Offense and Deficiency citations followed a familiar pattern with Tag 273 being cited 6 times in the month. 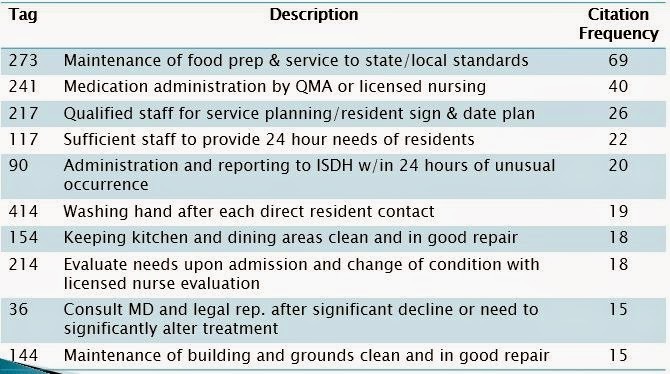 The failure to maintain food preparation and services areas in accordance with state and local sanitation and safe food handling standards is the leading tag for residential care facilities in 2014 (as it was in 2013). Next, Tag 217 was cited 5 times, the second highest amount for any month in 2014 for this tag. Failure to use appropriately trained staff for resident evaluation, and review of the plan with the resident signing off on any changes to the plan is ws the 3rd leading tag in 2014. Next, Tag 241 was cited 3 times in December for failure to have the medication(s) ordered by the resident’s physician administered by licensed nursing personnel or QMAs. Tag 241 was the 2nd most cited in 2014. Lastly, Tag 414 was cited 3 times in December for failure to ensure that staff washed their hands after each direct resident contact for which professional practice indicates that hand washing is appropriate. Tag 414 was 6th on the list of most frequent in 2014. Below is a chart of the top ten Offense and Deficiency citations in Residential Care Facilities in 2014. To review a summary of all of the December Offense and Deficiency citations, click here.